The Quartermaster Corps has been responsible for the care of the dead since the Civil War, This mission, which used to be known as “Graves Registration”, has evolved to include not only the search and recovery of remains on the battlefield, but to respond to any mass fatality situation. Army Mortuary Affairs Specialists have deployed around the world to assist in such places as Bosnia, Somalia, Croatia, the Middle East, Oklahoma City, Hurricane Andrew, Hurricane Katrina and most recently supported the Earthquake efforts in Haiti to recover American Citizens (AMCITS). Identification of remains is an important responsibility, a process that has been perfected to the point that even remains that are discovered many years later, can often be identified. Burial of the dead, at one time a Quartermaster Corps responsibility, is conducted with honors befitting a fallen soldier. National cemeteries were first established in 1862 and now number over 100. Military cemeteries located overseas are maintained by the American Battle Monuments Commission and contain the American dead from World Wars I and II. Today, the Army’s Mortuary Affairs Specialists are trained at the Quartermaster School at Ft. Lee. The 54th and 111th Quartermaster Companies, the Army’s only active Mortuary Affairs units, deploy from Ft. Lee when called. 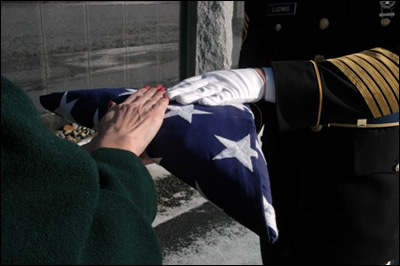 This duty to the fallen is owed on behalf of the Army and the Nation to the soldier, their comrades, and their family. It is a duty performed sadly but willingly.